South Korea describes itself as “the only country in the world” that has managed to transform “from an aid recipient into a donor country within the span of a single generation.” By the end of the Korean War (1950-53) between the Republic of Korea (South Korea) and the confusingly communist Democratic People’s Republic of Korea (North Korea), South Korea’s annual per capita income stood at just $67. Today, South Korea is the world’s 13th largest economy with a GDP of more than $30,000 per person. South Korea’s impressive transformation is the story of a highly educated and culturally rich nation that has made the most of the Post WW II trends of international economic development, globalization, and rapid innovation in information technology. 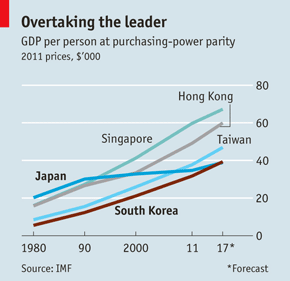 South Korea’s GDP per person was barely one quarter that of Japan in 1980. In April, 2012, the Economist reported that South Korea’s GDP per person could overtake Japan’s per capita income by 2017 according to forecasts by the International Monetary Fund (IMF). GDP per capita measured in terms of purchasing power parity (PPP), or what the equivalent of $1 will buy in different countries, is arguably considered “the best way to compare living standards” by many economists. The chart below from the Economist shows the juxtaposition of per capita incomes in South Korea, Japan and Asia’s other newly industrialized countries (NIC) or economies (NIE) since 1980. South Korea’s economic growth and development has largely relied on exports of manufactured goods by a handful of world-class industrial powerhouses. In the span of a few decades, Korean manufacturing conglomerates, known as chaebol, like Samsung, LG, Hyundai and Kia have staked out leading positions as global titans of industry. In the process, these corporate juggernauts that were largely unknown to many outside of Asia but a few years ago have rapidly emerged as global brands and household names. A total of thirteen Korean companies made the Fortune Global 500 in 2012, including: Samsung Electronics at No. 20, Hyundai Motor at No. 117, steel maker POSCO at No. 146 and LG Electronics at No. 196. Korea’s ranking compares favorably with those of other advanced and developing countries, including: Brazil (8 Fortune Global 500 companies), China (73), Germany (32), Japan (68), India (8), Italy (9), Mexico (3), Spain (8) and U.K. (26). It’s worth noting that the Fortune company rankings are also influenced by differences in the industrial structures of each country’s economy. While Korea’s economy has largely been led by the chaebol, more independent and smaller companies play a more significant role in the economies of many other countries. As in many other Asian countries, the efficiency of South Korea’s service sector lags that of most advanced economies at less than half of the average productivity of other member countries of the Organization for Economic Cooperation and Development (OECD), which South Korea joined in 1996. Samsung and Hyundai are among the most well-known of South Korea’s chaebol. The chaebol are massive industrial conglomerates with armies of subsidiaries that operate across a wide and growing number of industries. The five largest chaebol – Samsung, Hyundai Motor, SK, LG and Lotte – accounted for 55.7 percent of South Korea’s GDP in 2010. As South Korea has prospered, the chaebol have diversified further in order to take advantage of the country’s growing domestic market. From 2007 to 2012, the number of subsidiaries of South Korea’s top 30 chaebol jumped from 731 to 1,150 according to data from Statistics Korea, the national statistical agency, as reported by the New York Times. While the chaebol have contributed much to South Korea’s impressive economic rise, they have also increasingly come under fire for encroaching on the domain of Korea’s small business owners. Korea’s governing and opposition parties have taken up the issue in their bids to win the support of Korea’s electorate. South Korea has worked hard for its success. South Koreans put in considerably longer hours than workers in other OECD countries. In 2010, workers in South Korea put in an average of 2,193 hours, down from a head-scratchingly grueling 2,582 hours in 1997, according to data from the OECD Factbook 2011-12. By comparison, average hours per worker in 2010 were considerably lower in Germany (1,419 hours), Japan (1,733 hours), the U.K. (1,647 hours) and the U.S. (1,778 hours). The Korean Peninsula has limited reserves of natural resources, most of which are found in North Korea. During the Japanese colonial period (1910 to 1945), the North served as the center for mining and industry. South Korea is the world’s fifth largest importer of oil and relies on foreign suppliers to meet virtually all of its substantial demand for oil and natural gas. South Korean President Lee Myung-bak declared Low Carbon Green Growth would be Korea’s new development vision and formed the Presidential Committee on Green Growth (PCGG) in 2008. Korea’s green growth strategy emphasizes the importance of sustainability by promoting environmentally responsible lifestyles and private sector investment in green technologies and industries. The plan seeks to advance economic growth and create jobs while reducing greenhouse gas (GHG) emissions and combating climate change. In the green lifestyles category, a carbon-point system and Green Card program provide incentives for Korean households and consumers to reduce their energy usage, choose eco-friendly products and use public transportation. From 2008 to 2010, Korea’s 30 largest chaebol made green investments totaling 15.1 trillion won ($12.7 billion) according to a report by the PCGG, The Past Three Years of Achievements in Green Growth. From 2007 to 2010, Korea’s sales of green industrial goods catapulted from 1.25 trillion won ($1 billion) to 8.08 trillion won ($6.7 billion) while green and renewable energy exports jumped from $625 million to $4.54 billion, according to data from Korea’s Ministry of Knowledge Economy (MKE) reported by the Council on Foreign Relations. In a testament to South Korea’s commitment to green growth and sustainability, the 24-member board of the new U.N. Green Climate Fund (GCF) chose the Songdo International Business District in Incheon, South Korea as the site for the fund’s headquarters. Launched in late 2010, the GCF is intended to promote action on an agreement made by developed nations in 2009 to increase climate aid from roughly $10 billion per year to $100 billion by 2020. Recognizing the important links between R&D investments, growth and development, South Korea has made substantial, growing contributions to the global body of knowledge in science and technology. In 2009, South Korea had the third highest number of registrations with the U.S. Patent Office according to a report on global science research and collaboration by the U.K.’s Royal Society. By 2020, South Korea planned to increase its spending on science research from an already healthy 3.2 percent to fully 5.0 percent of GDP. By comparison, China and Brazil have each set spending targets of 2.5 percent of GDP, though their economies are significantly larger than that of Korea. Information communications technology (ICT) has played a key part in South Korea’s rapid development. 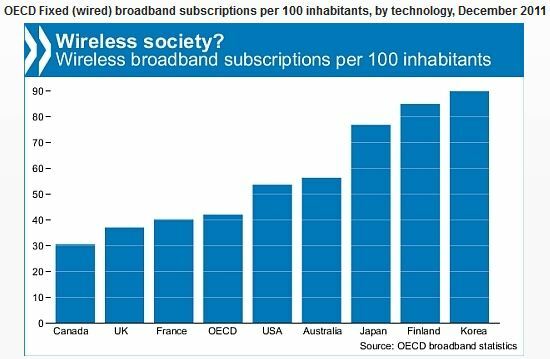 In the wireless broadband sector, South Korea is a global leader in network access, penetration and speed. The chart below from the OECD shows South Korea heading the pack of the world’s most highly connected advanced economies. The western name “Korea” dates to the Koryo Dynasty that ruled the territory closely aligned with Korea’s present-day borders from 918 to 1392. Following invasions by Japan in the late 16th century and the Manchus in the early 17th century, Korea became increasingly insular. The Choson Dynasty (1392 to 1910) sought to limit foreign contact largely to quarterly diplomatic missions to China and a small outpost of Japanese merchants near present-day Pusan in southeastern Korea. The Korean kingdom paid homage to China under the Chinese tribute system for centuries, though the arrangement apparently had little influence over domestic matters. Japan assumed control of the Korean peninsula after defeating China and Russia in 1895 and 1905. 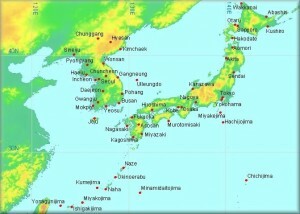 Following its victory, Japan colonized Korea and continued to rule over the territory until August 1945. 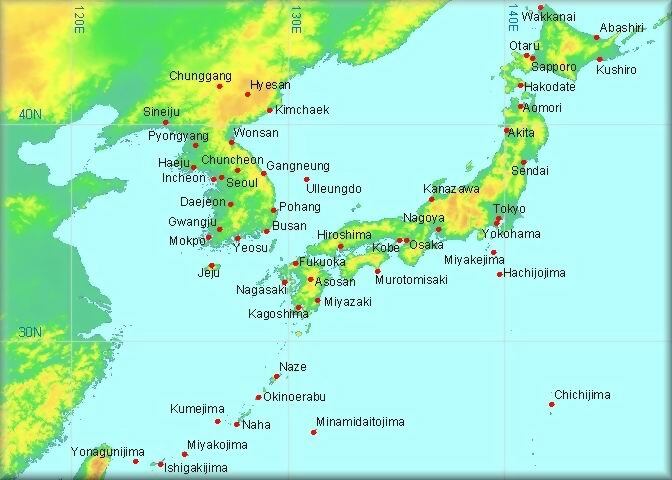 The Japanese colonial period was characterized by a number of brutal acts, including attempts to rid Korea of its native language and cultural identity. On the other hand, Japan also set up steel, cement and chemical plants that left Korea the second most industrialized country in Asia, after Japan, by the end of Japan’s colonial rule. After World War II in 1948, pro-U.S. and pro-Soviet governments were established in Seoul and Pyongyang, and the Cold War between the U.S. and U.S.S.R. rapidly escalated. In June 1950, North Korea invaded South Korea with the backing of the U.S.S.R. and China. In July 1953, the war ended nearly where it had begun leaving a heavy toll of death and physical destruction in its wake. The U.S. and South Korea have a commitment to defend each other against outside aggression under the ROK/U.S. Mutual Security Agreement signed in 1954. At conclusion of the Korean War, a demilitarized zone (DMZ) was established at the 38th parallel along the dividing line between South Korea and North Korea to keep the peace between the two nations. To this day, U.S. and North Korean military forces continue to patrol and stare each other down across the DMZ in an eerie, perpetual stand-off that has been well documented by 60 Minutes and a host of other international media outlets. In February, 2007, the U.S. and South Korea agreed to transfer the authority for wartime command to South Korea in 2012, which has since been pushed back to 2015. The U.S. military currently stations 28,500 U.S. troops in South Korea, down from 37,000 troops in 2004 when the U.S. handed control of some military bases to South Korea. In October, 2012, South Korea and the U.S. reached an agreement to extend the range of ballistic missiles that South Korea could deploy to about 500 miles (800 km) from the previous limit of 186 miles (300 km). The longer range would be capable of reaching any target in North Korea without flying far enough to pose a threat to Japan or China. South Korea had long maintained that more powerful missiles were needed to counter North Korea’s enhanced missile and nuclear capabilities. (Sources for Korea History and International Relations section include: Asia Society. Korean History and Political Geography. Korea borrowed key elements of its culture from China, including the use of Chinese characters that still appear in Korean newspapers today and Neo-Confucianism. Originally from India, Buddhism also came to Korea by way of China before spreading to Japan. The national dietary staple in Korea is a pungent, spicy dish called kimchi, without which no Korean meal or refrigerator seems to be complete. Made from fermented vegetables, kimchi accompanies everything from tofu to the wide variety of tantalizing Korean barbeque offerings like kalbi or galbi and bulgogi. For those seeking to experience the pleasures of modern Korean cuisine, a few other tasty items to consider include: pajun, a seafood and scallion pancake; mandu, dumplings similar to Japanese gyoza or Chinese potstickers; jap chae, stir-fried vermicelli noodles with vegetables and meat (optional); and bibimbap, steamed rice topped with vegetables, egg and meat (optional) that is best ordered crackling away in a steaming hot stone pot (dolsot bibimbap).